Just a quick update before we sleep. Tonight, we received the request from Sendai missionaries to go north tomorrow. I am leaving at 4:30 am Thursday, Japan time, with two believers to rent trucks an hour west of here. (Since this is moving season in Japan, truck rental is at a premium.) We will drive back while Woody is seeking the permits from the police to go north. Then we will drive north to Yokohoma Costco to buy items and pack the trucks, next on to Tohoku. This time, our fifteen-year-old son Daniel, Mr. Oomizu (a church member), Rev. Tateishi (whose son is pastor of East Sendai church), and Rev. Hayashi (whose father is pastor of Watari church) will join Woody and me to drive north and deliver the goods. We are grateful that Mr. Watanabe and Mr. Kurihara, also believers, will travel with us to Costco to buy goods and pack the trucks (last time it took us five hours to complete). Please pray for our safety (trucks must be returned by Friday night), sweet fellowship with each other and the believers up north, and especially, that the Lord would prepare the hearts of the Japanese people to hear and believe the gospel as they receive supplies through the churches. Please convey our deepest gratitude to all our brothers in the OPC who are giving to our God on behalf of these people, that the love of the Lord would be poured out upon them. We are grateful for our Savior Jesus whose precious blood grants to us forgiveness of our sins and sweet fellowship with the only true and incomprehensible God. Greetings in the precious Name of our Savior and Lord Jesus Christ. Together with the Psalmist, I pray and confess, "I will lift up my eyes to the hills. From whence comes my help? My help comes from the Lord, who made heaven and earth.... God is our refuge and strength, a very present help in trouble" (Ps. 121:1, 46:1). 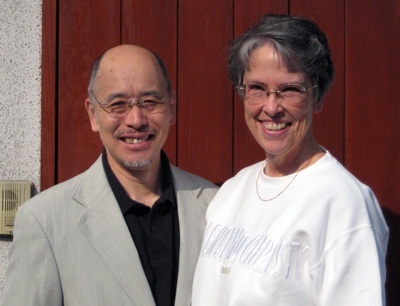 God spared the Yaegashis and the gospel work of the Yamagata Reformed Church. Our house and the church building are still in good shape (at least we think so) at present. The devastation of the Pacific coastal towns and cities has already come into your hearing and viewing through TV and internet. In Miyagai Prefecture alone, where two OPC families, the Cummingses and the Uomotos, labor whose houses providentially in God's gracious plan were spared, it has been reported that the number of deaths will reach over 15,000 people. In the midst of the disaster, these two missionaries who live in Sendai, the prefectural capital, have been daily laboring in bringing relief to those staying at various evacuation centers near Sendai and who lost everything. Their relief activities became possible just a day or two after the earthquake thanks to Luke Cummings', the youngest son of the Cummings family, involvement in a volunteer group which had gotten a permit to drive on the expressway to bring food and hygienic goods from Tokyo to Sendai and then to those evacuation centers in the Sendai area. Then, as soon as the Diaconal Committee of the OPC made a speedy decision to give financial aid through its Japan Mission for the disaster relief, the Rev. Woody Lauer, another OPC missionary working in Numazu, about 600 km south of Sendai, also obtained a permit to drive on the expressway. He then transported a few trucks full of food and necessary daily items to Sendai from Numazu. Woody's son David and his wife joined in this transport of relief goods. Thus the OPC relief work has been in action since last week. In Yamagata, where the earthquake did not do much noticeable damage, we were able to meet on the first Sunday after the great earthquake and we offered prayers and began thinking how we could be of help to those who are in desperate need. While unlike the other three missionaries I cannot participate in vigorous relief effort due to the shortage of gas and my limited strength, I was able to pull together the willingness of my church members and seekers to help the evacuees who fled to our city. About four thousand people have evacuated here from Iwate, Miyagi and Fukushima prefectures. People from Fukushima are those who were afraid of contamination of radiation because of the break-down of the four nuclear reactors in Fukushima. Before the worship service this Sunday, March 20th, I met with the members of the steering committee of the church and decided to do two things: begin collecting donations for relief funds and ask members and seekers to bring items that are urgently needed for those who are at the evacuation center, sheltering more than one thousand people, in Yamagata City. Thus we too began a relief mission this week. Because of the shortage of gas our people bring goods to the church every Sunday and I transport them to the evacuation center. I was able to take about $500 worth of items to the evacuation center this week. Please pray that I can continue going out there since it is pretty hard to get gas even in Yamagata. We get just three gallons or so after waiting in a long line for two hours. Lots of gasoline stations in Yamagata are closed indefinitely. As you can imagine if this is how it is here in Yamagata, the places of disaster are much worse in terms of transporting food and medical supplies. Today's paper shows that at 33 evacuation centers located within the disaster area of the Northeastern District of Japan's main island, on average, the need for food (three meals a day) is met only 20%, medical supply 60%, doctors' presence 70%, and daily necessary items (toilet paper, diapers, soap, detergent, etc.) 50%. We need your continuous help and prayers. While there was no serious damage to the houses and roads in Yamagata, since the Earthquake, life in general has become difficult materially and to some degree mentally/spiritually for people here. There is definitely a mission waiting for us to help people rebuild their lives not just materially but spiritually. Our prayers certainly are that people will find their true meaning of life in their one and only Creator and Savior, our Lord Jesus Christ. Then we have Christian brothers and sisters with whom we have worked for a long time who are now suffering from the disaster. There are at least two RCJ churches in the Sendai area that were damaged badly. One in particular is Ishinomaki Church, which was flooded and had structural damage. Pastor Shiratsu and his wife are staying at an evacuation center and they certainly need Christian care. There are also members who are still missing and others who had their houses damaged. The whole nation's economy is getting chilled and it is affecting our life as my tent-making job for March and April is decreasing; in such circumstances it is difficult for us to plan a big overseas trip. ... I do not know how the Lord is going to use Katie and me during this time of trial for my country. But we know by faith God has a plan through these trials for His kingdom to be built here in Japan, for which the Lord has called us to join His army to reach that end. I remind myself of the truth taught by our Lord in Matthew 25:35-40, in James 2:14-17, and again in Matthew 16:26. And finally, our help comes from the Lord who created heaven and earth! May the Lord grant us all to see his sovereign power and grace be sufficiently shown to the people of Japan who have not yet known their Savior. And through you and us working together with the indwelling power of the Holy Spirit, may we demonstrate the fruit of love, joy, peace, kindness, goodness, faithfulness, gentleness and self-control, especially in a time of hardship like this. Please continue to surround our missionaries' labors with your prayers. We also received an updated report on conditions facing the various RCJ churches and chapels from the RCJ's Diaconal Action Committee.